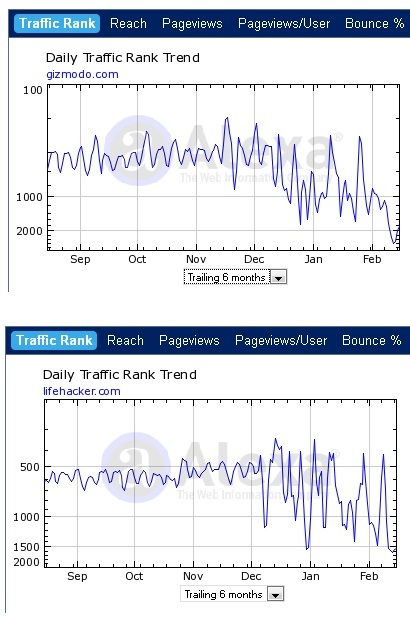 Alexa rank and traffic of Gizmodo (link) and LifeHacker (link) is plumbing since their new design, which is proving to be interesting but not usable. The drop in traffic from search means that the new design is not working well in terms of search engine optimization (SEO). This traffic collapse is happening because of the design changes only, as they are not facing any penalty from search engines or they didn’t do something wrong in terms of their content update. In the new design, they have provided option to scroll down and read more content by using mouse scroll in different static boxes. The previous design of these sites were bit simple and visitors used to find more content while scrolling the page. It was easier to find related content and tags as well, and to share them in social networks. That’s why it seems that Gizmodo, Lifehacker and other Gawker’s sites are facing less views/visits and that’s why this traffic collapse is happening on these sites.